Good weather is around the corner. The time will come when we will have to take those T-shirts out of the drawer and let them gently wrap around our bellies not always fitting the way we expect. 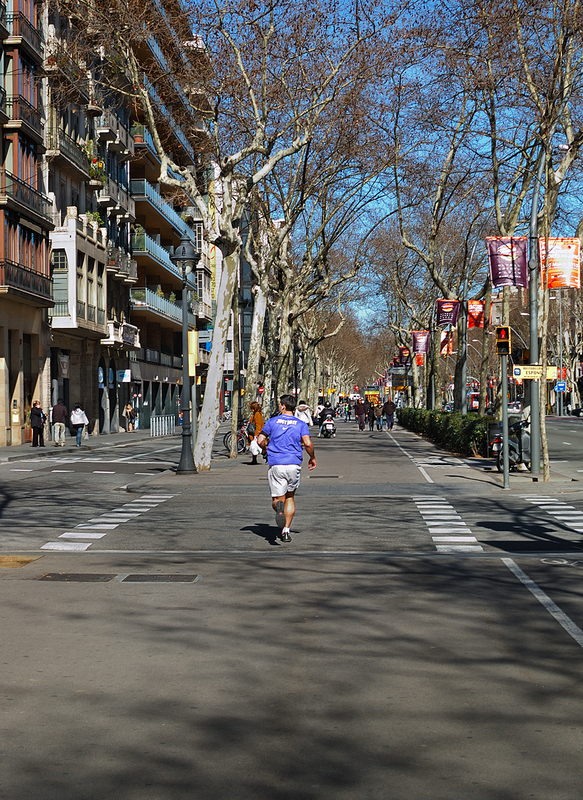 While watching this jogger running along Gran Via de les Corts in Barcelona and noticing that well known slogan on his Nike sweat shirt - Just do it -, I can't help laughing to myself: Just do it? Come on! During these Easter holidays I got into my sports clothes, took a deep breath to wake up early and jog around the neighborhood. I can swear I tried my guts to just do it but suddenly my legs ceased to exist, disappeared, gone, kaput as if by chance I had trodden on wet cement. My brains were somewhere else, betraying me in connivance with my feet, stubbornly advising to halt. If at least I had brought a couple of beers with me I could have carried them easily on top of my belly and go sipping happily along the sidewalk. Just do it? I wonder who the heck came up with that slogan. Maybe it's only about will. Or they are telling you, just go and buy those fabulous running sneakers. You'll be as fatter as can be but it will be fun and you'll look so smart that you won't even care about your shape! Note: The above story is only fictional. The author is in shape and has nothing to do with or against multinationals. Nice, I can feel the change in the air blowing through the trees in a big city...we need that because, citys change more slowly that humans can perceive in one afternoon. Always a safe step ahead of him - especially as the traffic light is red. Hola Carlos, excelenete fotografía, gran panoramica, felicitaciones. How I miss this street ! I wonder if the gypsies are still hanging out at the stoplights trying to wash car windows. Beautiful shot. What a great city! I love Barcelona, I hope to come back soon. A beautiful well known spot of the gorgeous city of Barcelona!